Feeling all loved up this Valentine’s Day? Looking for the perfect romance to finish your day with a loved one? Well look no further because the writers at Flickering Myth have been voting on our absolute favourite romance and romantic-comedy films to help you plan your Valentine’s evening. What’s it about? A little known movie about the ill-fated first, and only, voyage of the giant ship Titanic, encapsulating the romance between a third class passenger and a first class passenger during it’s journey to the bottom of the Atlantic Ocean. Why watch? The romance between Titanic’s Jack (Leonardo DiCaprio) and Rose (Kate Winslet) is a tragic yet wonderful love story. The two passengers never should have met but when Jack thwarts Rose’s attempt at suicide and saves her life, they promptly fall in love. 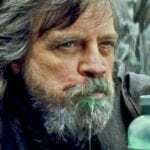 After leading a somewhat sheltered life and being semi-forced to marry Cal (Billy Zane), Rose is shown the time of her life by Jack, and they have a raucous few days. The Titanic tragically hits an iceberg (but you knew that right?) and the entire second half of the film is dedicated to Jack and Rose’s attempts to leave the ship together in order to start a new life together in America. 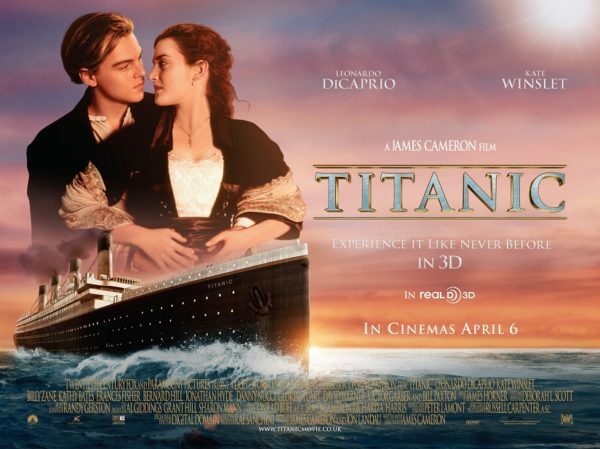 If the love story between Jack and Rose doesn’t entice you, then the depiction of Titanic’s 1912 voyage is a must-see – Cameron shot real footage of the sunken ship and built a version of the ship to film on, utilising the set fantastically during the tense action scenes. We shan’t spoil the ending for you just in case you’ve been living under a rock for the last twenty years, but suffice to say it’s been the subject of a lot of debate over the years! What’s it about? Are you serious? You don’t know what this about?! Shame on you! William Shakespeare’s tragic story about the star-crossed lovers is brought to life in the most spectacular way possible. Why watch? Set in a modern day Verona but spoken in Shakespeare’s English, Romeo + Juliet includes a cracking soundtrack, stunning direction and the most colourful set of costumes you will ever set your eyes on. 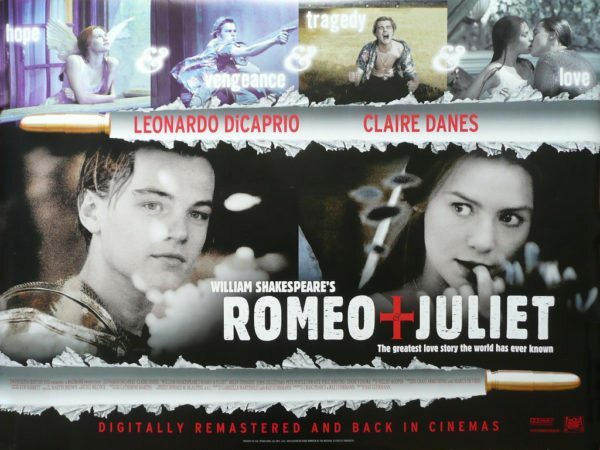 Featuring early performances from DiCaprio as Romeo and Danes as Juliet, their superb performances will tear your soppy hearts apart as the doomed lovers take their own lives in order to spite their feuding families (don’t accuse us of spoilers, the story is over 400 years old). What’s super special about this version of Romeo + Juliet is that the story has been modernised without changing a thing from the original text. The difficult language is handled skilfully by the entire cast; whilst being dazzled by the stunning set pieces you’ll feel great empathy for the loved up teenagers. With outstanding supporting performances from the whole cast, with special mention to Harold Perrineau’s Mercutio, you will definitely be wishing a plague on both their houses by the end of the film. What’s it about? A powerful business man hires a stunning local prostitute to accompany him to his busy schedule of social engagements. Why watch? Pretty Woman is the ultimate romantic fairy tale. Vivian (Julia Roberts), a woman struggling to make ends meet, turns to prostitution under the direction of her drug addicted friend and happens to get picked up by Edward (Richard Gere) after he stops to ask for directions to his hotel. After Vivian quite literally charms the pants off him, Edward decides to hire her services for a few days so that she can accompany him to various events. Some of the most famous scenes in rom-com history follow; the necklace box scene, the shopping scene, the piano scene – need I go on?! The chemistry between Gere and Roberts is electric and it’s hard to not root for them – two broken humans who find and save each other. There really is nothing not to love about this film. If you aren’t fussed about the love story then watch Pretty Woman for the final scene. If you don’t feel all warm and fuzzy, then you must have a heart of stone! What’s it about? A newly married loved up couple inadvertently steal drugs from the Mob and are chased across the USA in an attempt to reclaim them. Why watch? This is not your average romance! Violence, torture, death, Elvis hallucinations – this film is mile a minute viewing and is certainly not for the faint of heart but you’ll love if you fancy a bit of action this Valentine’s Day. Written by Quentin Tarantino, although not directed by him, this film is a must-see for his fans. Clarence Worley (Christian Slater) and Alabama Whitman (Patricia Arquette) meet at a cinema and fall in love, only for Clarence to find out that Alabama is in fact a prostitute. After rescuing her from the brothel she works at and killing her boss, Clarence and Alabama make a run for it, not realising that they’ve picked up a bag of drugs that belongs to the Mob. Along the way, the couple meet various people (there is an EXTRAORDINARY supporting cast) who try to help them get rid of the drugs and away from the mobsters. 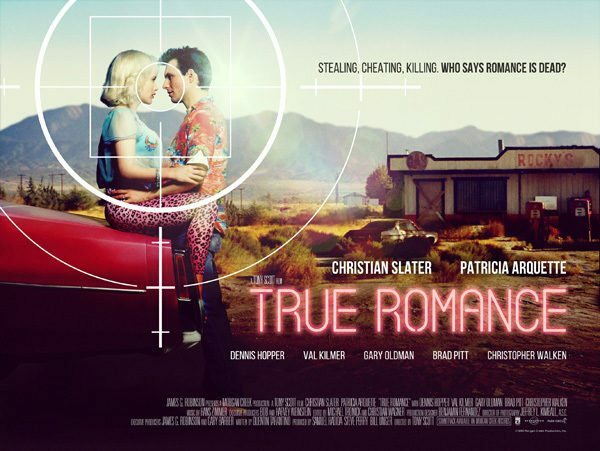 If you’re not fussed about the romance, then True Romance is a must see for the action alone. What’s it about? 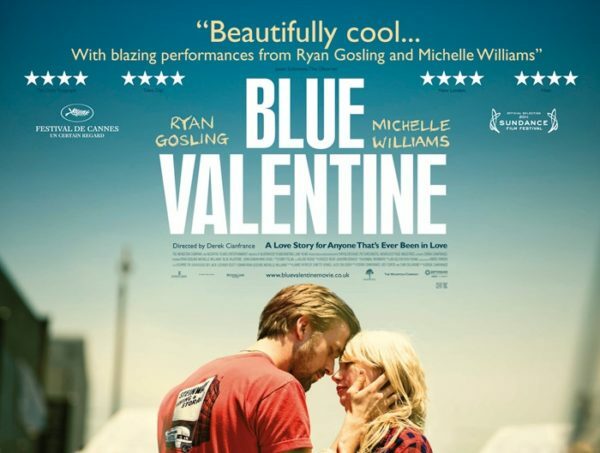 Set over several different time periods, Blue Valentine depicts the relationship of a couple, from their initial meeting to the end of their marriage. Why watch? Dean (Ryan Gosling) and Cindy (Michelle Williams) come from very different worlds. A high school dropout and an aspiring Doctor, Blue Valentine shows the rise of their love for one another coupled with the many pitfalls and differences that they have, against the backdrop of an unwanted pregnancy, alcoholism and failed dreams. Blue Valentine is a somewhat maudlin romantic drama but it’s almost guaranteed to make you think of at least one couple you know, who stay together despite having some level of hatred for one another. If you’re not bothered about the romance, watch it for Williams’ and Gosling’s performances – both nominated for Golden Globes and Williams for an Oscar, their depictions of Dean and Cindy are truly awe-inspiring.